Janet Duncton is a lifelong resident of the Petworth area and her family are farmers on the Leconfield Estate. She is a long-term Chichester District Councillor, and a past Chairman of the Petworth Town Council and member of the Petworth Twinning Association. She is the proud grandmother of Oscar Duncton, mother of Tessa and Tim, and wife of Chris. Janet loves the countryside and enjoys walking, cycling, gardening, cooking and knitting. 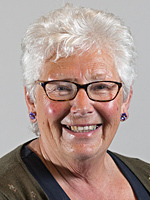 Janet is the Chairman of the County Council.